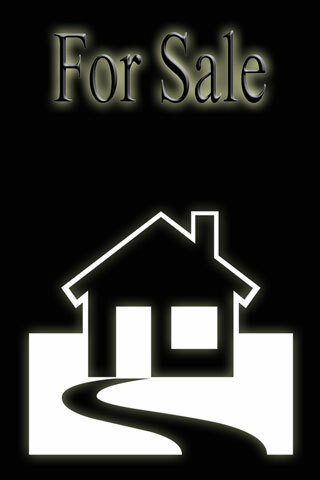 A graphic of a house for sale is boldly displayed in black and white. Whether you are looking for your first house, a larger house, or are moving to a new area, you can contact local real estate agents for assistance. Let them know how many bedrooms and bathrooms, approximate square footage, and other features you would like in your home so that they can find potential matches. If you are just starting to look, take a weekend drive and find "For Sale" signs in neighborhoods that you like. A search of the local real estate market can often yield the home you are dreaming of! The advantages of using a local real estate agent are outlined on the website Local-Real-Estate.com. This website outlines how local real estate agents, who are familiar with the character and trends of an area, can help their clients find the best home for their needs. It includes tips for evaluating real estate agents, as well as for choosing a home to buy and getting a house ready to sell. Links to real estate services are also included. Website visitors can learn about buying and selling homes in the USA, find local real estate agents, and locate carefully chosen realtors and real estate franchises in their state. All information on Local-Real-Estate.com is provided "as is." This website contains reference information and resource links about real estate agents and services. By using this website, you agree that Zeducorp is not responsible for errors or omissions, and shall have no liability for damages of any kind, including special, indirect, or consequential damages, arising out of or resulting from any information, product, or service made available hereunder or the use or modification thereof. Thank you for visiting the Local-Real-Estate.com website. We trust that you have found our site useful, and we invite you to place a link to Local-Real-Estate.com on your website. Simply copy the following HTML link and paste it on one of your website pages to reference this informative real estate reference guide. We appreciate your consideration. Local-Real-Estate.com, a division of Zeducorp. Local-Real-Estate.com is a Chosen Sites™ resource.